An environmental group blasted the new recommendations as toothless and said California should be taking the pesticide off the market after scientists for three state agencies found it was toxic and couldn't be safely used at any levels. 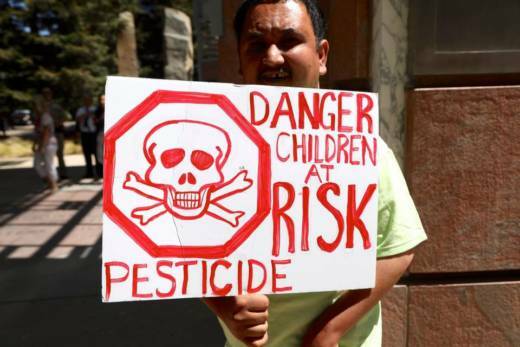 "Unfortunately, these are voluntary recommendations for local officials that have no weight of law behind them," said Paul Towers of the Pesticide Action Network. "Instead of taking this brain-harming pesticide off the market, California officials are again passing the buck." The California action comes as the state considers long-term regulations to restrict the use of chlorpyrifos and designate it as a "toxic air contaminant" that poses a risk of serious illness or death. The action by California comes as the state proposes designating chlorpyrifos as a "toxic air contaminant" that poses a risk of serious illness or death. "This is like our short-term fix," said department spokeswoman Charlotte Fadipe. "We've already started down a longer road to a permanent fix."